MY AGE: A pup of sixteen. THE PLACE: A wallpaper store in downtown St. Petersburg, Florida. THE SCENE: My mom and I had made numerous trips to the store, and there was one paper we yearned for. It was by Van Luit and featured peacock feathers. We looooooooooved the paper but it was well out anything my parent’s could afford. So we caressed the luscious paper and fantasized about papering a whole room in our house with its shimmering beauty. And, yes, this was an odd thing for a sixteen-year-old boy to be yearning for. So, it should not be a surprise that this boy later did something really odd, and purchased the Cross House. Now, hold on tight while we fast forward through time: 1973, 1974, 1975, 1976, 1977……………2014. Wow. That is always such a rush! As I write these words I am no longer sixteen but somehow, geez, fifty-seven. Fifty-seven! When did that happen? Of late I have been pondering wallpaper for the Cross House. After ten months of mostly structural, electrical, plumbing, and HAVC issues, it is kinda fun to think about aesthetics for a brief moment. 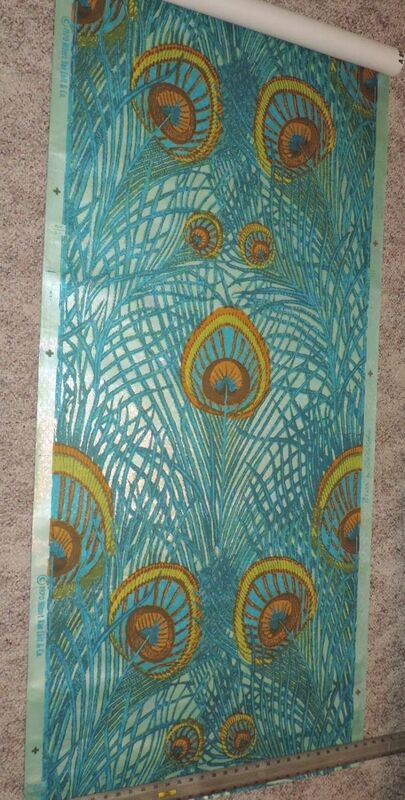 Thus, I was on eBay doing a search for Vintage Wallpaper. A single roll of Van Luit Peacock wallpaper. My heart stopped. I have not seen this paper in, gulp, forty-one-years. And suddenly I was sixteen again, and could clearly recall all the emotions over something so seemingly beautiful yet unreachable. And now, after placing the winning bid, the unattainable was now…mine. And for all of $41. ABOVE: I know, kinda awful! But also kinda wild & cool. I actually love it, still! 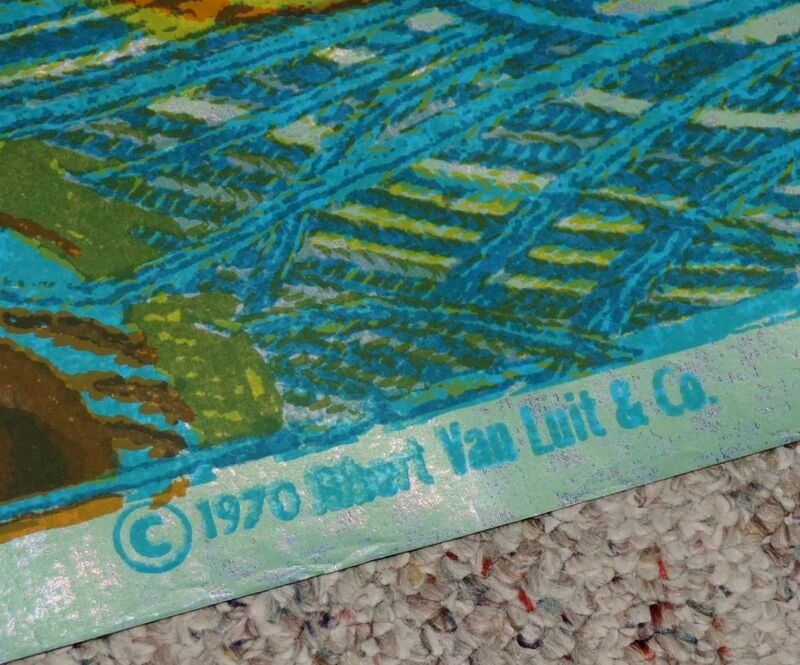 ABOVE: The Van Luit imprint. Now, I would N E V E R want a whole room in this paper. My head would explode. And I only have this single roll anyway. After some pondering I think I know the perfect location. 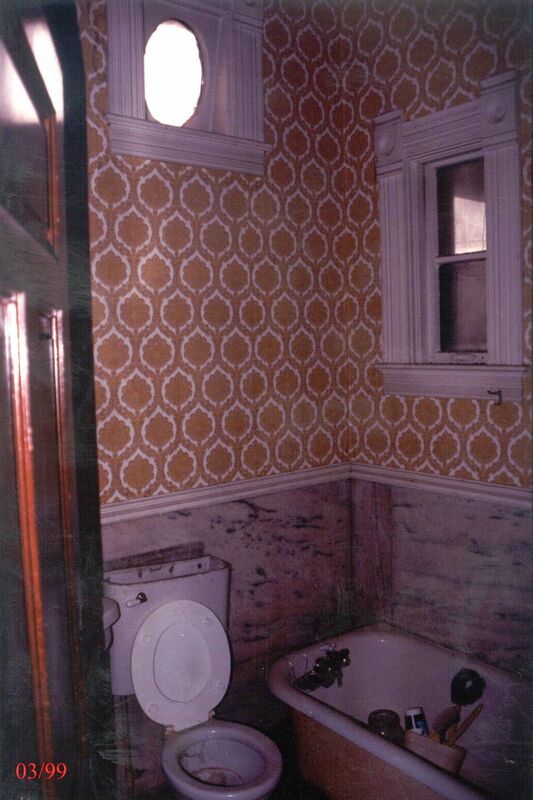 ABOVE: This is the bathroom on the first-floor of the Cross House. I call it the Marble Bath. The image is from 1999, and the wallpaper is 1970s. The bath no longer looks anything like this. It is currently gutted; the marble slabs are sitting in the dining room, and the walls had to rebuilt due to water/termite damage. The good news is that the bathroom will be back together in 2015. Whoee! Anyway, I have enough paper (I hope) to do just one wall. So, I was thinking about the wall with the oval window (isn’t the window cool!). This is the wall with the sink, too (to the left of the toilet). So, just one wall of the peacock paper, and the other three painted, I dunno, maybe the chartreuse color in the paper. Once the bath is finished, I will feel a rush of being sixteen every time I pee. 13 Responses to Peacocks in the House! Can you please put a pic up of the bathroom [as it is] now? I will being doing a whole post on the Marble Bathroom. Soon! Let’s discuss how much I love peacocks and this paper. I hope the perfect place you found is in my house. Amy! You made me laugh! But I am NOT sharing even a square inch of the peacock paper! I waited 41 years! It is mine!!!! Lol, absolutely love this post!!! I LOVE that paper! Its perfection on a roll. I was hoping you were going to line the phone closet with it. I would hide in there and just sit a drool over my paper! Although, the potty is another great place to sit. I love laughing at your posts. I love the paper, but may I suggest… Put it where you can look at it while sitting on the pot so it can be fully enjoyed. Also, I LOVE bright colors, but the chartreuse walls might be too distracting from your focal point of the room, the peacocks. My choice would be soothing green paint to let the paper pop instead of fighting in the Chartreuse Caboose. I am highly focused on restoring the architecture of the house to its 1894 condition. However, I feel some liberty regarding the decor! We have this wallpaper in our dining room. It is still fabulous. It works best above some wainscoting, I think. I would love to see an image! “Peacocks” by the potty. Perfect location, Ross! The paper really offers a touch of dramatic beauty; nice colors! Hell – you’ve got it, so flaunt it. I would use every scrap of that roll in that bathroom. If someone doesn’t like it, well who invited them anyway.